The New World common marmoset monkey (Callithrix jacchus) has fast become one of the leading nonhuman primate models for advancing our understanding of neurobiology with many groups directing their attention to the species. Many features make it suitable for contemporary imaging, and behavioural paradigms, including its lissencephalic cortical sheet, relatively short gestational period, rapid postnatal development and amenability to genetic manipulation. In my presentation, I will discuss the recent advances my group has made towards investigating the anatomy and function of the marmoset monkey pulvinar through techniques including: diffusion tractography; in vivo confocal/ two-photon imaging; and, visual behavioural tasks. From this combination of paradigms, we now have a greater understanding of the role of the visual pulvinar during development and throughout the lifespan, and its involvement in dorsal stream development and plasticity. Associate Professor James Bourne is currently a Group Leader at the Australian Regenerative Medicine Institute and NHMRC Senior Research Fellow, and is a member of the NHMRC Research Committee. James completed his undergraduate training in Biochemistry (Hons) at the Imperial College of Science, Technology and Medicine, London. Following this, he pursued a PhD in the field of Neuropharmacology, undertaking a joint project with the Ministry of Defence (UK) and King's College, London. 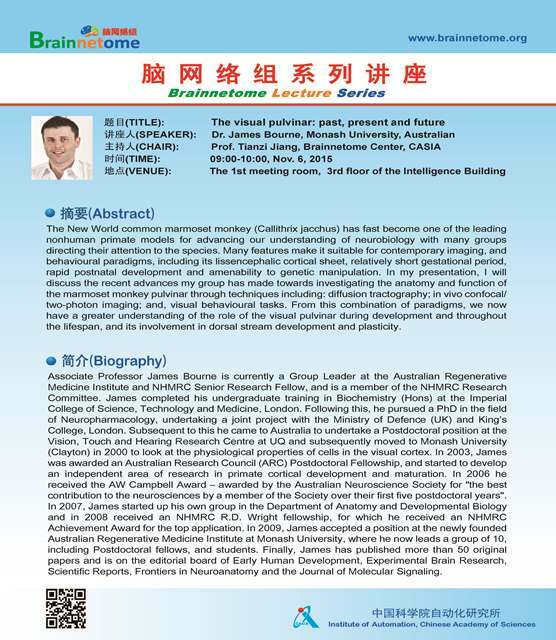 Subsequent to this he came to Australia to undertake a Postdoctoral position at the Vision, Touch and Hearing Research Centre at UQ and subsequently moved to Monash University (Clayton) in 2000 to look at the physiological properties of cells in the visual cortex. In 2003, James was awarded an Australian Research Council (ARC) Postdoctoral Fellowship, and started to develop an independent area of research in primate cortical development and maturation. In 2006 he received the AW Campbell Award – awarded by the Australian Neuroscience Society for "the best contribution to the neurosciences by a member of the Society over their first five postdoctoral years". In 2007, James started up his own group in the Department of Anatomy and Developmental Biology and in 2008 received an NHMRC R.D. Wright fellowship, for which he received an NHMRC Achievement Award for the top application. In 2009, James accepted a position at the newly founded Australian Regenerative Medicine Institute at Monash University, where he now leads a group of 10, including Postdoctoral fellows, and students. Finally, James has published more than 50 original papers and is on the editorial board of Early Human Development, Experimental Brain Research, Scientific Reports, Frontiers in Neuroanatomy and the Journal of Molecular Signaling.